Piano Concerto No. 2 in G minor, Op. 22 (1868) [25'39]. Symphony No. 9 in E minor, Op. 95, 'New World' (1893) [42'40]. Saint-Sa�ns' Second concerto is a constant source of delight, and a new recording is always welcome. Graz-born Vorraber has recorded the complete Schumann for Thorofon. He is an impressive pianist, with the right idea of 'Romantic sweep' as well as being equipped with the requisite delicacy. The piano sound - Vorraber uses a Steinway - has good depth and the interpreters do well with the 'free-form first movement (12'50). Vorraber sparkles well in the 'Allegro scherzando', just occasionally veering towards the too-heavily-toned. A pity though that the piano trills in the finale do not buzz with more energy and it is here, curiously, that his sparkle could do with the application of a smidgen of Duraglit. 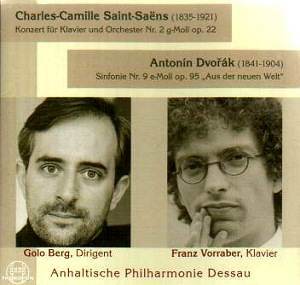 Beware if you plan to hear the disc straight through � there is too short a break between the two works here included. Having said that, perhaps it isn't too good an idea anyway. A promising start to the 'New World' (fair drama, plus silent rests that are actually counted correctly for once) leads alas to a low-voltage Allegro molto, with a very, very indulgent second subject. When we arrive around the eight-minute mark, Berg is really losing the thread. Basically this conductor shows no evidence of the ability to hear structurally whatsoever. The tuning in the opening wind chords of the famous Largo should have been dissected in rehearsal as in concert it is fairly painful. The strings try for some level of 'Innigkeit' but do not really achieve their objective, while the 'moment of magic' of the oboe's semiquaver entrance at 8'04 represents another miss. A Scherzo imbued with some life needs to be still more on-the-ball. The Trio is far too slow; it sounds just like a rehearsal speed. The final chord of this movement, actually, sums up the entire performance: half-hearted and not exactly together. The recording itself seems lacking in depth for the opening of the finale, but at last there is some grit from the strings. Too late, realistically, though, and Berg keeps on losing the dramatic thrust of the argument. I take it that it was fear that made the principal horn player slur up to his high (sounding) E natural in this movement; whatever it was, it does not encourage repeated listening.